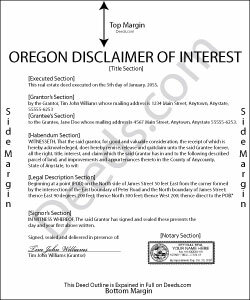 As part of the Oregon Revised Statutes, the beneficiary of an interest in property may renounce the gift, either in part or in full (ORS 105.623 to 105.649 Uniform Disclaimer of Property Interests Act). Note that the option to disclaim is only available to beneficiaries who have not acted in any way to indicate acceptance or ownership of the interest ( 105.623). The disclaimer must be in writing and include a description of the interest, a declaration of intent to disclaim all or a defined portion of the interest, and be signed by the disclaimant ( 105.629 (3)). Deliver the disclaimer within nine months of the transfer (e.g., the death of the creator of the interest) to the personal representative of the decedent's estate, the trustee or file it with the court having authority to appoint such a person with the probate court of the county that has jurisdiction over proceedings regarding the estate of the deceased donor. In addition, deliver a copy of the disclaimer in person or send it by registered mail to any personal representative or other fiduciary of the decedent's estate ( 105.642). If the transfer was enacted by an instrument other than a will, deliver a copy of the disclaimer to the trustee or the person who has legal title to or possession of the property ( 105.642). If real property is involved, record a copy of the disclaimer in the office of the probate judge of the county in which the property or interest disclaimed is located ( 105.646). A disclaimer is irrevocable and binding for the disclaiming party and his or her creditors ( 105.629 (5)), so be sure to consult an attorney when in doubt about the drawbacks and benefits of disclaiming inherited property. If the disclaimed interest arises out of jointly-owned property, seek legal advice as well. Michele S. said: This is a great service if you know what youre looking for. Unfortunately it just wasnt right for me and my situation. Reply from Staff: Thank you for your feedback Evtishios. Heather F. said: Quality forms and information. Everything went smoothly. Reply from Staff: Great to hear Heather. Have a fantastic day! E. Louise S. M. said: Your site is simple, easy to use, and an outstanding service. Reply from Staff: Thank you Fred, have a great day!